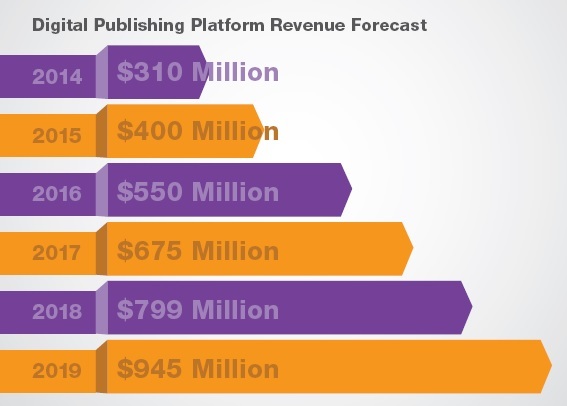 Digital publishing software is currently experiencing rapid adoption, and InfoTrends estimates that the digital publishing platform market will experience a compound annual growth rate (CAGR) of 25.5 percent over the next five years. While the technology for digital publishing platforms has been in existence for some time, the adoption of solutions is now accelerating outside the traditional market of print service providers and publishers. Large printers, enterprises, book publishers, magazines and newspapers are all beginning to adopt this technology. Because this market is not yet fully developed, larger vendors that are established in enterprise software and print production workflow have the opportunity to come in and acquire smaller players — or disrupt the market by offering their own solutions. These vendors can also serve as an educational resource for enterprises and others that are looking to use the technology.